PJM’s highly anticipated re-evaluation of its largest-ever congestion-reducing transmission project reiterated staff’s analysis that the project’s economic benefits to the region exceed its costs. 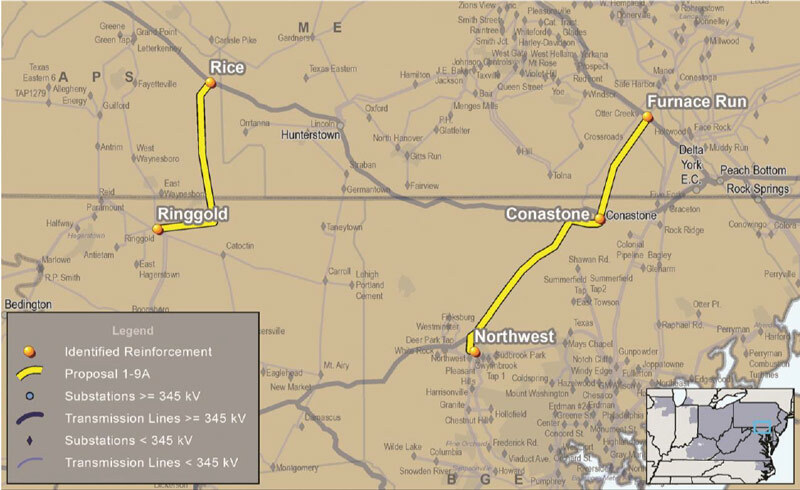 The $366.17 million project proposed by Transource Energy — the Independence Energy Connection — would consist of two separate 230-kV double-circuit lines, totaling about 42 miles, across the Maryland-Pennsylvania border. One line would run between the Ringgold substation in Washington County, Md., and a new Rice substation in Franklin County, Pa.; the other would run between the Conastone substation in Harford County, Md., and a new Furnace Run substation in York County, Pa. The RTO published its findings in a white paper released Thursday that showed a final benefit-cost ratio of 1.4, down slightly from the 1.42 staff reported at the September meeting of the Transmission Expansion Advisory Committee. The slight decrease is attributable to a roughly $8 million increase in the project’s 15-year annual revenue requirement to $505.85 million. The benefit — measured in decreased load costs — held steady at $707.29 million. The actual estimated project costs increased from $366.17 million at the TEAC meeting to $372.2 million in the white paper. The 1.4 ratio is still higher than the previous 1.32 evaluation from February and well above the RTO’s 1.25 threshold to consider projects. The current analysis shows that without the project, reliability violations will materialize as early as 2023 on three 115-kV lines in Adams County, Pa., the 500-kV Peach Bottom-Conastone line and the 500/230-kV transformer at Three Mile Island. The project will also increase the ability to import power into the Baltimore Gas and Electric locational deliverability area. The inclusion of newly identified reliability benefits has done little to sway the residents’ opposition, who believe it’s a ploy to avert the project’s potential failure at the state level. Shaw also accused PJM of fixing the ratio analysis and decried the millions of dollars taxpayers and ratepayers are already on the hook for, whether the project ever gets built or not. FERC approved a designated entity agreement for Transource Energy to construct the AP South Congestion Improvement Project, subject to the outcome of a formula rate case. PJM announced that its comprehensive analysis and recommended solution for issues related to Artificial Island won’t be ready until April.